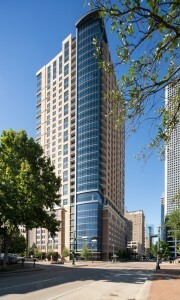 Hines Market Square, now known as Aris Market Square, is a mixed-use multi-family development that was designed to blend with the old-style architecture of downtown Houston. This 327,345 sq. ft., 33-story development contains 274 boutique-style residences, eight parking levels, 9,000 sq. ft. of retail space on the ground floor as well as a private pocket park courtyard connecting to Main Street. Camarata Masonry Systems, Ltd. (CMS) knew this was going to be a landmark building in the heart of Houston’s Historical District. Because the project was located in downtown Houston and the adjacent restaurant was expanding simultaneously, the lack of work space was the largest obstacle in the construction of this project. A combination of conventional frame, light swing stage scaffolding and a four point suspended scaffold system was used to build the facade of the tower. The swing stage scaffolding was required above the adjacent restaurant while the four point suspended scaffold system was designed to break into sections so the rest of the installation could be completed in a spiral sequence. Additionally, the custom four-point system had two levels which allowed other precedent trades to access a level above to complete their scope of work and thereby allowed CMS to follow closely behind with the installation of the brick veneer. All deliveries were just in time since jobsite laydown space was non-existent. Once materials arrived, they were immediately distributed into the building. All mixing operations were performed on each floor and the materials were pushed out of the window and balconies and onto the stages. The work had significant damage and injury exposure but CMS worked almost 91,000 man hours with no recordable or lost time injuries. The workmanship on the façade is outstanding, with all conspicuous lines crisp and straight and all reveals and accent details aligned perfectly with surrounding building elements. CMS is proud to have met its goal of providing innovative scaffolding solutions allowing the efficient and safe installation of a high quality ‘old world’ masonry façade in the heart of Downtown Houston.